One of my favorite HP storylines that they left out of the movies was Hermione and her quest for equal rights for the elves (also known as S.P.E.W.). Every girl I knew loved Hermione and her strong will and determination, so it only seemed right to start the week off with my favorite character from the books. And because, lately, Chris has been complaining about the lack of sock pairs in his sock drawers I thought it was only fitting to make a Harry Potter laundry sign. I really wanted to use Oracle 651 vinyl for the sign so that I could do the letters in different colors, but I ruined all the pieces of vinyl I used. *sigh* I finally figured out why the vinyl was messing up every time I tried to cut it, did you know that you can make the letters thicker by offsetting them in the software? Yea, I definitely didn’t! So I took a few hours and reconfigured the saying on my software to make the letters bigger until I was happy with the way they looked. Sixth time was the charm! First, paint your wood board and distress it to your liking. I used the same method from this project. Design your saying in the Silhouette Designer Software, or download my file here. Cut the file out with your Silhouette and then weed the letters. Place transfer paper over top of your weeded letters and then transfer it over to your laundry sign. Next, figure out where you’re going to place your mason jar and clothespins. Mark the spots with a pencil on your laundry sign! 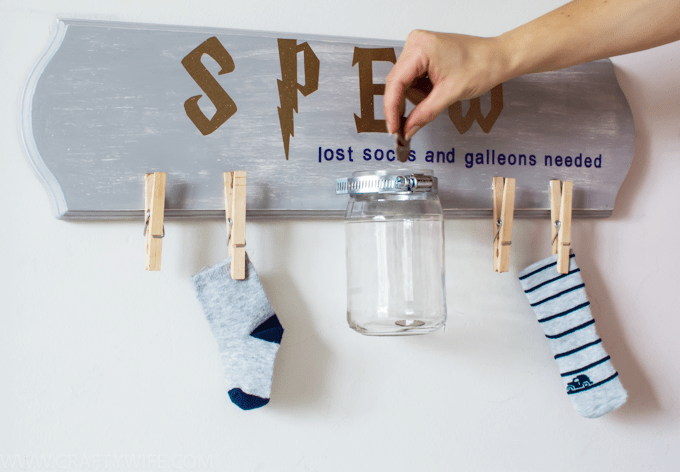 Glue your clothespins down onto the wood and then use this method to attach your mason jar. Stand back and admire your work, you’re finished! What was your favorite storyline that they left out of the Harry Potter books? Ive always been upset that they left everything out about Lupin and Tonks’ relationship! The baby, all the secret visits, Harry and Lupin’s fight, Harry being godfather, Teddy being at the station with the family at the end….come on! Me too!!! Oh my gosh, I loved the significance of the Lupin/Tonks relationship and how Teddy was supposed to be like Harry in some ways. I swear, nothing will ever compare to the awesomeness of the books, no matter how much I love the movies.